January 5, 2011 - Boeing again has partnered with Qatar Airways and the non-profit global health and disaster relief organization AmeriCares to deliver a second consignment of relief supplies to areas in Pakistan that are still recovering from the massive floods that ravaged the country in August. The first shipment was delivered in September 2010. The 2010 Pakistan floods began in July 2010 following heavy monsoon rains in the Khyber Pakhtunkhwa, Sindh, Punjab and Balochistan regions of Pakistan and affected the Indus River basin. 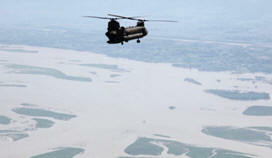 At one point, approximately one-fifth of Pakistan's total land area was underwater. According to Pakistani government data the floods directly affected about 20 million people, mostly by destruction of property, livelihood and infrastructure, with a death toll of close to 2,000. The number of individuals affected by the flooding exceeds the combined total of individuals affected by the 2004 Indian Ocean tsunami, the 2005 Kashmir earthquake and the 2010 Haiti earthquake. Monsoon rains were forecasted to continue into early August and were described as the worst in this area in the last 80 years. The Pakistan Meteorological Department reported that over 200 mm (7.88 inches) of rain fell over a 24-hour period in a number of places in Khyber Pakhtunkhwa and Punjab and more should be expected. A record-breaking 274 mm (10.7 inches) of rain fell in Peshawar during 24 hours, previously 187 mm (7.36 inches) of rain was recorded in April 2009. So far 500,000 or more people have been displaced from their homes. On 30 July, Manuel Bessler, head of the UN Office for the Coordination of Humanitarian Affairs, stated that 36 districts were involved, and 950,000 people were affected, although within a day, reports increased that number to as high as a million, and by mid-August to nearly 20 million affected. By mid-August, according to the governmental Federal Flood Commission (FFC), the floods had caused the deaths of at least 1,540 people, while 2,088 people had received injuries, 557,226 houses had been destroyed, and over 6 million people had been displaced. One month later, the data had been updated to reveal 1,781 deaths, 2,966 people with injuries, and more than 1.89 million homes destroyed. On Tuesday a consignment of about 35,000 pounds (15.8 metric tones) of medical supplies was loaded into the cargo hold of the new Boeing 777-300ER (extended range) delivered to Qatar Airways. 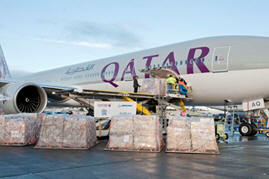 The airline subsequently will ship the relief goods from Doha, Qatar to Pakistan. "This is the second time in four months that Boeing has partnered with Qatar Airways and AmeriCares to help the people in Pakistan where the need is still great," said Liz Warman, director of Global Corporate Citizenship Northwest Region, Boeing. "Providing timely medical care is critical; though the floods have receded, the aftereffects such as sickness and disease continue to affect the people in these disaster zones." Over the years, Boeing and airline partners as well as non-profit partners in the Humanitarian Delivery Flights (HDF) program have collaborated on many humanitarian missions and the Boeing 777-300ER was used on a number of those missions.